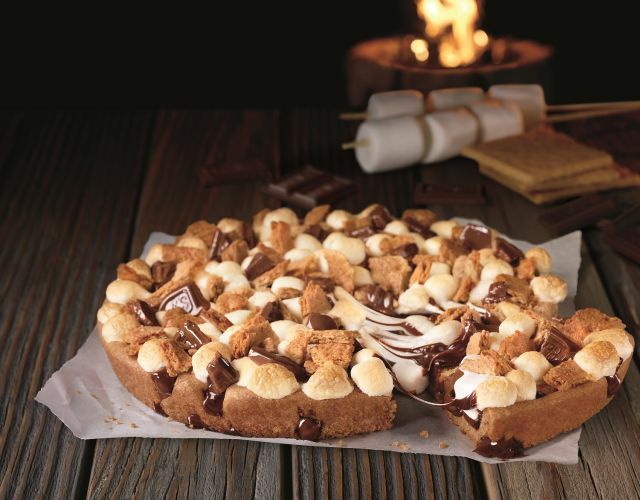 Pizza Hut offers their take on a summer campfire classic with the debut of the new Hershey's Toasted S'mores Cookie. Available for a limited time at participating locations, the new dessert features the Ultimate Hershey's Chocolate Chip Cookie topped with mini marshmallows, chunks of Hershey's Milk Chocolate Bar, and graham cracker pieces. This isn't the first time that Pizza Hut offered a variant of their existing desserts. Last year, they gave their brownies the marshmallow treatment with last year's Hot Chocolate Brownie.